If you own a boxer dog, I bet you know how active and athletic they are. Given their daily activities, it is important that they are well fed so they can thrive well and stay healthy. However, some boxer owners find it hard to choose which food will work best for their pet. 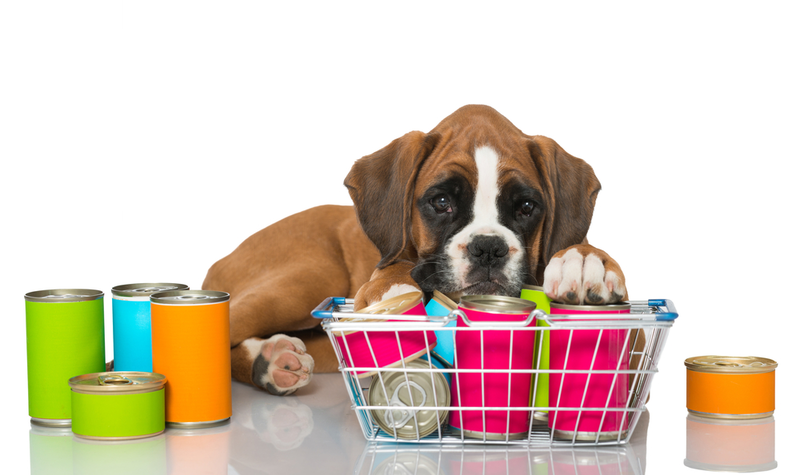 In this article, I will help you select the best dog food for boxers without sacrificing their health. If your boxer pet is choosy when it comes to food, I highly recommend you trying the BLUE Life Protection Formula Adult Dry Dog Food. Made of deboned lamb, this revolutionary dog food is guaranteed to be delicious and appetizing. In addition, since it uses lamb as its main ingredient, your dog will get the maximum amount of protein per serving. This is perfect for boxers since they are overly active and demanding for nutrition. To ensure the health of your canine, Blue Buffalo ensures there are no artificial colors, flavors, and preservatives included in the recipe. In fact, it is also packed with wholesome whole grains, vegetables, and fruits. Thus, your dog is getting the most vitamins and nutrients per serving compared to other brands. Worried about quick degradation if you buy in bulk? Not on this one. To ensure that this dog food lasts longer than other brands, it was meticulously processed at low temperature. This method also locks in and preserves the potent components essential to your dog’s nutrition. Priced relatively cheaper compared to other brands, you are surely getting the best bargain with BLUE Life Protection Formula Adult Dry Dog Food. If your boxer is too choosy and did not like the first option, you may want to consider this alternative pick from Blue Basics. BLUE Basics Limited-Ingredient Formula Adult Dry Dog Food is specially formulated using turkey and potato as main ingredients. Containing only lean and deboned turkey meat, you can ensure that this dog food does not include other protein sources such as chicken or beef. Most poultry products may cause harmful effects to your pet. BLUE Basics Limited-Ingredient Formula Adult Dry Dog Food is an excellent choice for your dog as it is corn, egg and dairy free. In addition to being a very potent source of protein that supports the active lifestyle of boxers, this product is also packed with tons of vitamins and minerals from natural sources. Using a precise blend of fruits and vegetables, your dog can easily get the perfect serving of vitamins and antioxidants. For more energy sources, easy to digest carbohydrates are also included in the recipe like potatoes, brown rice, and oatmeal. Your dog has never had such a complete and nutrient-loaded meal as the BLUE Basics Limited-Ingredient Formula Adult Dry Dog Food. If you do not want to spend a huge portion of your budget for dog food but still eager to feed quality meals to your pet, you might want to consider this next product. EUKANUBA Breed Specific Adult Dry Dog Food is an affordable way to provide the right amount of nutrition to your canine. At a relatively reasonable price, you can feed your dog with high-quality food packed with all necessary vitamins and minerals. Unlike other products, EUKANUBA Breed Specific Adult Dry Dog Food boasts its 3D DENTADEFENSE System. This is a unique characteristic of this product that helps reduce the buildup of tartar for up to 28 days. In addition, it only uses animal sources to provide your boxer with enough protein that it needs for strong, lean muscles and superb body condition. Furthermore, this product contains ingredients that foster healthy joints and hips which is perfect for energetic boxers. Aside from muscles and joints, this product also contains L-carnitine and taurine from natural sources. These compounds help promote a healthy heart for your pet. With great taste and an affordable price tag, there is no reason for you not to like this dog food for boxers. 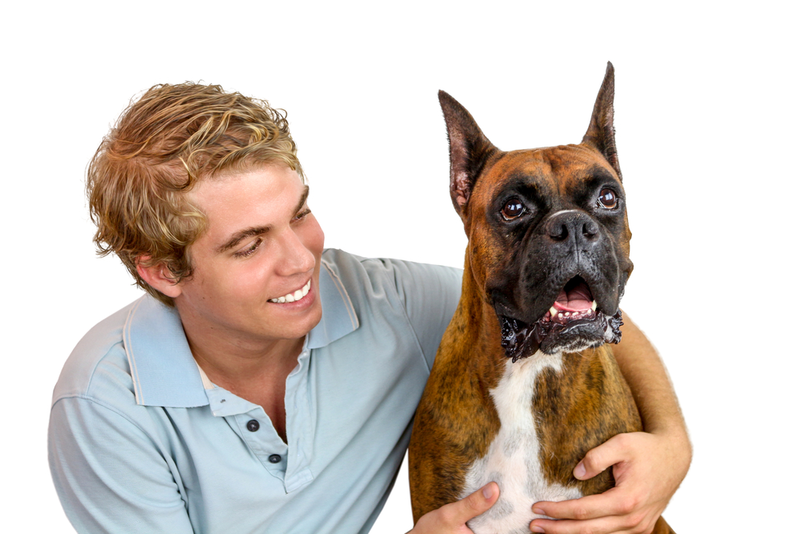 If you love your boxer a lot and do not mind spending more on dog food that provides a whole bunch of benefits for your boxer, this option might be the best option for you. This Boxer Puppy dry dog food is a high-end product that helps your pet build lean and healthy muscles. With 28% protein and L-carnitine, you are sure to provide enough amount of protein-building amino acids perfect for the demands of this fantastic canine. To avoid any digestion problems, this product helps support an ideal balance of intestinal flora that fosters digestive health. Besides, it is also packed with prebiotics and complex of antioxidants. These nutrients promote optimal health and strengthen their immune system to avoid diseases. Boxers are very active dogs. Hence they need to have strong joints and bones. ROYAL CANIN BREED HEALTH NUTRITION Boxer Puppy dry dog food is the best product that helps strengthen your dog's spinal and leg structures. Finally, every kibble of this dog food is exclusively designed into wave-like bits so that boxers can easily grasp and chew them. Now more than ever, having a healthier and stronger boxer is easy and practical with this revolutionary product from Royal Canin. The last option on our list is a quality product from Nutro. Similar to other mainstream brands, this product also offers the nutrition and benefits that will make your boxer more energetic and lively. Using chicken meat as its primary ingredient, it is perfect for optimal brain development and healthy growth. It also includes whole grains and a unique combination of 12 superfoods working together to provide your pet with the necessary vitamins and minerals that help your boxer grow healthy and smart. To give the right amount of protein needed by boxers, it also uses lamb and salmon meat. Guaranteed to have zero artificial flavors and preservatives, the health of your dog is guaranteed and ensured. What makes NUTRO ULTRA Puppy Dry Dog Food different compared to other brands is its dry consistency. You can either serve it as a stand-alone meal, or you can combine it with wet foods. You have a lot of flexibility depending on your boxer’s preferences. For holistic health, ingredients of this product also help support strong bones, healthier heart, and maximum vitality. Guaranteed to contain zero corn, soy, wheat, and GMO ingredients, you are getting the best value for your money with this flagship product from Nutro. Now that the options are here for you to choose from, it is time to select which will best suit your boxer. If you own a boxer, I’m sure that you are enjoying a lot of time playing with them. If there’s a breed of dog that crawls straight to your heart because of how active and playful they are, that’s the boxer. They seem to have an unlimited energy and never fail to impress with their personality. I have my own boxer, and I know them best. Given their intensity and strength, you can’t merely feed them with anything. As an owner, it is your responsibility to ensure that they get enough nutrients to keep them active. 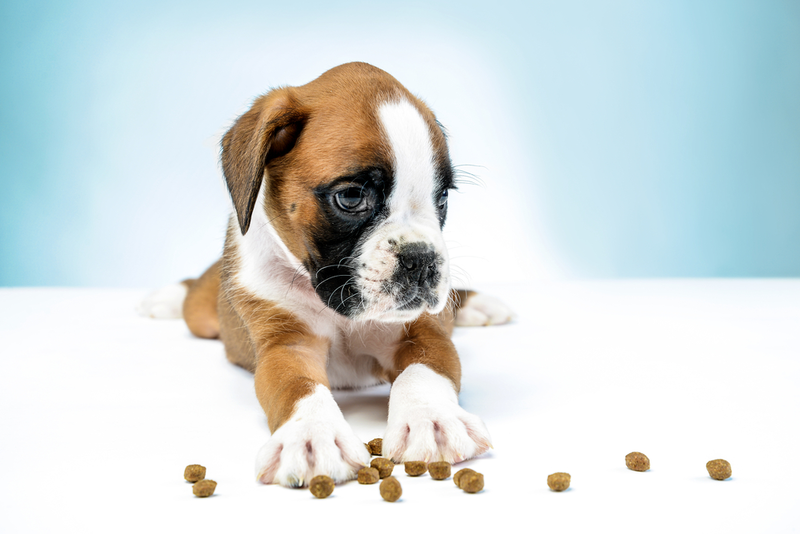 However, given a lot of dog food options in the market today, how can you ensure that what you give your boxer is precisely what he needs? Below are some essential factors that you need to consider in selecting the best dog food for your boxer. Using this relevant information, you can narrow down your options and eventually reach a decision that you and your pet will surely love. Dog’s metabolism works like humans. According to All Boxers Info, they need to consume between 800 to 1600 calories on a daily basis depending on how heavy they weigh. However, this amount may vary depending on how active your boxer is in the first place. In addition, factors like age or pregnancy may also affect the calorie intake. Hence, you need to ensure that you are giving your canine the right amount of food to reach their calorific requirement. It is important to check the nutritional label of the dog food to know how many calories per serving does the food offer. In the same manner, avoid also overfeeding your dog as it may result in various issues such as indigestion, obesity, and behavioral change. Ever wondered why boxers have a bulky physique? Those are lean muscles that are continuously developed with the help of your dog’s active lifestyle. Hence, to ensure that these muscles remain strong, you need to ensure that boxers are fed with high enough amounts of protein. Unlike other breeds of dogs, the majority of boxers’ diet has to contain proteins. However, you must also consider the source of the protein. You can’t simply feed your dog with chicken or fish as they can make your pet stinky or they might reject it. One of the most recommended sources of protein for pet food is lamb. It has the best fat to lean meat ratio which is very potent with protein. However, be sure that the dog food uses deboned lamb meat or else your energetic canine friend might choke. Though protein is a significant requirement for a boxer, vita﻿﻿mins and minerals need not be sidelined. As a boxer owner, you need to ensure that the overall health of your dog is well taken care of and protein alone can’t do all of this. Hence, you need to make sure that vitamins and minerals are included in your dog’s diet through the dog food. These nutrients will help keep your d﻿﻿og’s tee﻿﻿th and bones strong to support its active behavior. In addition, certain vitamins can help keep their heart healthy and their hair better. Lastly, specific nutrients help keep their electrolyte levels within the target level. Boxers, just like us, may be prone to specific allergies that could be detrimental to their health. They can acquire allergies from the environment and other sources, but the food is its most common source. For boxers, certain grains and other processed carbohydrates may trigger allergies. Consequently, these food items are commonly used as fillers by dog food manufacturers to bulk up their products at lower cost. To ensure that your dog does not get allergic reactions to this food, make it a habit to check the label of the dog food. Though some companies may hide these in their nutritional label, you can tell if the dog food is no good if your dog developed some spots and skin issues. If this happens, immediately stop feeding them with the dog food and consult your trusted veterinarian. When it comes to dog food, size and consistency matters. Most dog foods are available as chunks while others are marketed as soft and mushy. Both types are generally fine as long as your canine loves it. However, when it comes to coarse dog food, be sure that the size is just enough for your dog to swallow. Some dog foods are too big for boxers to chew. In addition, check the hardness of each piece before feeding to your dog. Make sure that they can easily break the food down using their teeth and will not cause laceration on their gums. There is no better person to tell you which among these best dog food for boxers is the most recommended other than those who own one. I am fortunate to have a 16-month boxer which I love dearly. For me, no other product can provide my canine with the complete bundle of nutrients other than the BLUE Life Protection Formula Adult Dry Dog Food. Allow me to cite a few reason why. First, it supplies my dog with tasty kibbles packed with enough protein for muscle growth. My boxer is active just like other dogs that belong to the same breed. Hence, I want him to have the optimum amount of protein, and BLUE Life Protection Formula Adult Dry Dog Food can offer that. Second, I can easily provide the right amount of food since I have a reliable nutritional information on the label. You will find it easy to measure and serve just the right amount of food that your boxer needs. Besides, it is also a potent source of vitamins and minerals - perfect for the development of my dog. Made of ingredients that rarely result in allergies, I am confident that my pet will get all the nutrients that he deserves. ​Finally, this product is sealed and delivered. Thus, the integrity of the content is preserved, and contamination is next to impossible. Give your boxer the meal that he deserves. Purchase BLUE Life Protection Formula Adult Dry Dog Food today.